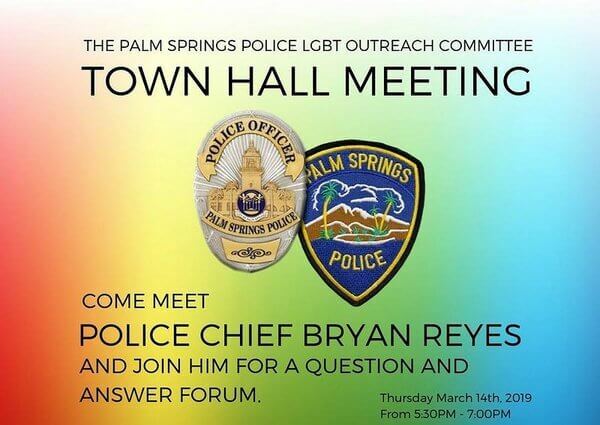 The Palm Springs Police Department LGBTQ Outreach Committee will be hosting their Annual Town Hall meeting with the Palm Springs Police Department featuring Chief Bryan Reyes, Captain Mellissa Demarais and Lieutenant Gustavo Araiza. 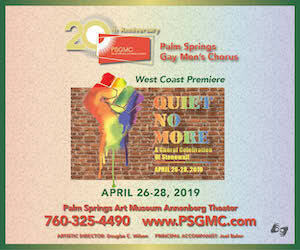 The event is scheduled for Thursday March 14th, 2019 at 5:30pm at the Mizell Center located at 480 Sunrise Way in Palm Springs (corner of Ramon Road and Sunrise Way). The theme of the evening is “Stonewall 50 Years of Change, Our Past, Present and Future”. A sign language interpreter will be present. 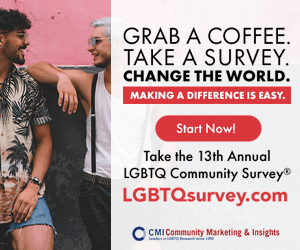 There will be a short video about Stonewall, a brief historical overview of the earlier relationship between the PSPD and the LGBTQ Community and the strides we have made to date in positively solidifying our relationship. There will be statistical crime data updates since our last Town Hall, as well as discussions regarding programs as we move forward, and finally a Q&A segment with questions fielded by Chief Reyes.